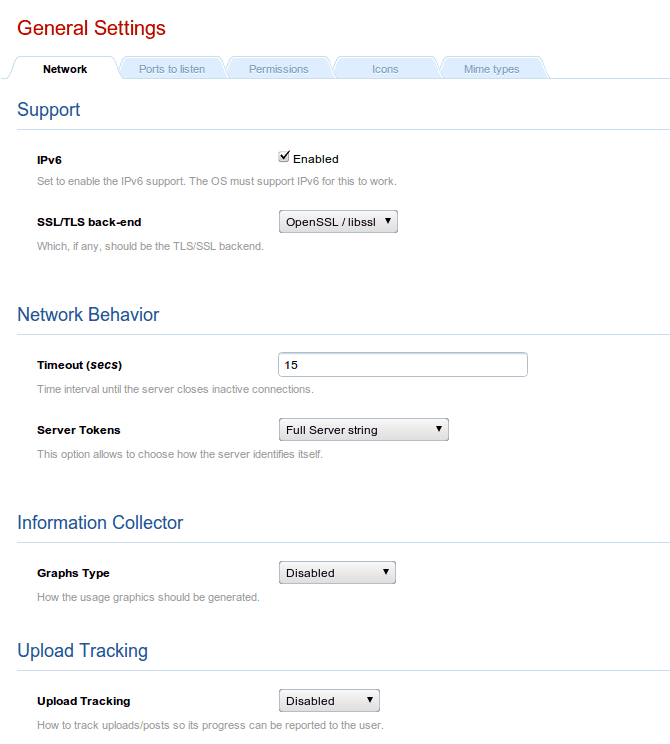 The IPv6 configuration key brings the possibility of activating or deactivating the IPv6 support at the server. If Cherokee has been compiled with IPv6 support (--with-ipv6), this configuration entry will be fully functional, otherwise it will be ignored. Specifies the TLS/SSL backend to be used, if any. The current option is OpenSSL. Sets the number of seconds that Cherokee will wait before closing the connection. This specifies the string that Cherokee should use to identify itself. By default, Cherokee will use Full. Through this you can enable or disable the usage of RRD graphs. Check the usage graphs section for more details. This section allows to configure the ports that the server will be listening to. You can add several different ports, and configure whether they will be used for HTTP or HTTPS. Each binding entry can be configured to listen to a network interface. In case the text entry is empty, the server will accept connections from that port on any interface. The User directive configures which user the Cherokee daemon will normally run as. By default, Cherokee runs as root which is considered undesirable in all but the most trustful network configurations. The User directive used in conjunction with the Group directive instructs the daemon to switch to the specified user and group as quickly as possible after startup. 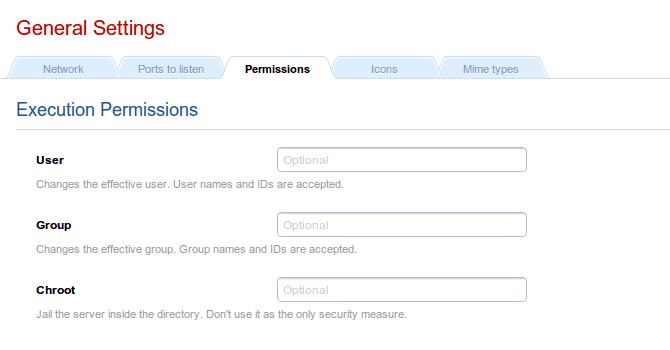 There are two possible formats: using the user or group name, or using the system ID. Cherokee can be jailed inside a directory. Note that this should not be used as the sole security measure. The icons configuration file associates an icon image with one or more file extensions. This information will be used mainly by the dirlist handler. This allows to associate icons with extensions. Directory: In this case, it specifies the icon to be used with Directories. ParentDirectory: This entry is used to assign an Icon to the "go to the parent directory" action. Default: This is the icon that will be shown if any of the previous ones matched. 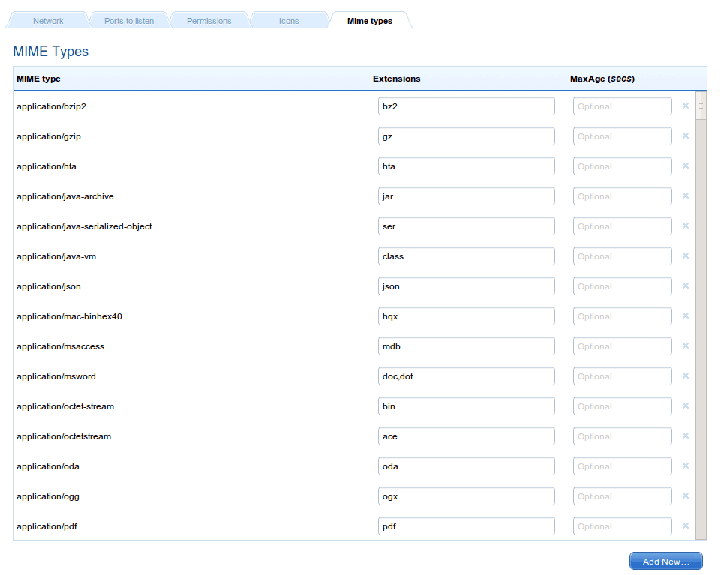 This section allows to add support for new MIME types or edit the existing ones. Mime Type: this is the proper mime string. Extensions: the file extensions for this type of contents. Max Age: defines for how long a file of this type must be cached at the client’s side.